iVend™ vend sensing system virtually eliminates misvends and ensures product delivery or credit back. Easily the most influential technology to come to the vending industry in decades, iVend™ is an infrared light sensing unit consisting of a light emitter and receiver. During the first vend cycle, if a product is not sensed by the iVend™ system, the system waits one second then initiates a second vend cycle and rotates the helix until the product is sensed as dropped. If a product is still not sensed as dropped by the iVend™ system after a full rotation to the home position, the selection will be considered empty or sold out and the customer's credit will be restored and will trigger the display message MAKE ALTERNATE SELECTION. The selection is then automatically reinstated for future vends. Your customers is always satisfied. Accounting/DEX Records number of misloads. 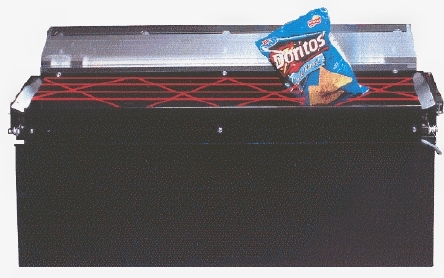 Included now on HR23, HR32, HR40 snack machines and the Dominator 29 Combo machine.